Offering free storage for ski equipment, this resort is 5 minutes’ walk from Keystone Lodge & Spa. All rooms offer free WiFi. Guests can relax in a hot tub. Kids 12 and under receive free lift tickets to Keystone Resort with a stay of 2 nights or more. Each room includes a fireplace, a TV and an en suite bathroom with a hairdryer at Lakeside Village by Keystone Resort. A full kitchen with a refrigerator, a microwave and coffee-making facilities are also provided. 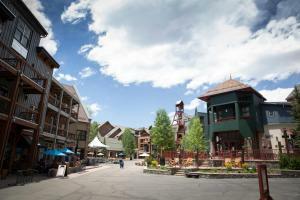 A free transfer service within the town of Keystone is offered at Keystone Lakeside Village. Laundry facilities are available on site. River Run Village is 5 minutes’ drive from the resort. Keystone Lake is 5 minutes walk from Lakeside Village by Keystone Resort. When would you like to stay at Lakeside Village by Keystone Resort ? This apartment features a fireplace, a TV and an en suite bathroom with a hairdryer. A kitchen with a microwave, a refrigerator and coffee-making facilities is also provided. This studio has a living room with a fireplace, a kitchen and a kitchen. Condo Check In West - Once you arrive into Keystone Resort turn right (South) at the Keystone traffic light (this is the traffic light by the Keystone Post Office, Grocery and Gas Station). After turning make an immediate right (West). Park in the lot on the left in front of Condominium Registration. Parking passes are included with your lodging accommodations. Each day we'll check prices and send you an email for your selected dates at Lakeside Village by Keystone Resort. If you don't have specific dates but would like to check prices for say next weekend or say next month we can check the price too. Click to write a review and share your experience of Lakeside Village by Keystone Resort with other travellers.